Place of Birth: Superior, Wisconsin, U.S.
Born and raised on a farm, Bong pursued his dream to become a pilot. At an early age, he was already fascinated by flight and making model airplanes. He continued his interest and enrolled in the pilot training program where learned how to fly an aircraft. He was among the United States elite fighter ace pilots in WWII . 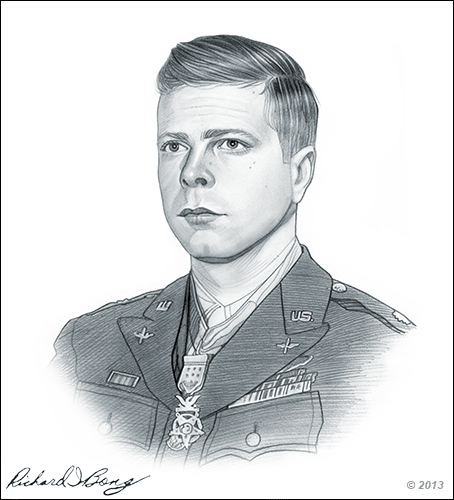 He was able to destroy at least 40 Japanese aircraft for which he was awarded the Medal of Honor. He may have died at an early age but his legacy, fame and influence lives on still. Richard Ira Bong was born on September 24, 1920 at Superior, Wisconsin. He was the son of the Swedish parents. Bong was the eldest among the 9 children. He grew up in the family farm where he farmed, hunted and fished for them on a daily basis. Richard Ira Bong was very athletic when he was young. He participated in sports as well as joining the church choir. At an early age, he was already fascinated with airplanes and had fun making model planes. At the age of 18, he enrolled at the Superior State Teacher’s College where he learned how to fly in the Civilian Pilot Training Program. From then on, the only way was upwards. He married Marjorie Vattendahl on February 10, 1945. The couple were not blessed with children as Bong died a 6 months after they were married. January 9, 1942 – He became a second lieutenant and became a gunnery instructor. June 12, 1942 – He was grounded for disobeying flying rules. July 1942 – His squadron was sent to England without him. September 1942 – He was transferred to another group, 9th Fighter Squadron which was based in Darwin, Australia. December 27, 1942 – He had his first combat victories when he destroyed a Mitsubishi A6M and Nakajima Ki-43 Oscar. He was awarded the Silver Star for this achievement. March 1943 – He went back to 49th FG which was based at Schwimmer Field. July 26, 1943 – He shot down 4 Japanese aircraft which earned him the Distinguished Service Cross. April 1944 – He destroyed 27 Japanese aircraft. September 1944 – He went to New Guinea following leave in May. December 1944 – He had tallied 40 victories. 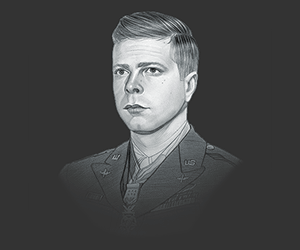 He was awarded the Medal of Honor by General Douglas MacArthur. On August 6, 1945, he flew one of the new experimental P-80 Shooting Star jet fighters but noticed the plane’s primary fuel pump was malfunctioning during takeoff. He to switch over to the auxiliary fuel pump but was unable to do so. He could not bail out of the aircraft as the parachute would not have deployed a result of the aircraft's low altitude. The plane crashed into a field next to Oxnard Street and Satsuma Avenue. He died instantly due to the severe impact. • Richard Bong Theatre in Misawa, Japan and the 613th Air and Space Operations Center, Thirteenth Air Force, Hickam Air Force Base, Hawaii. • Bong avenues on the former site of the decommissioned Richards-Gebaur Air Force Base, on Lackland AFB in San Antonio, Texas, on Luke AFB in Glendale, Arizona, on Elmendorf AFB in Anchorage, Alaska, and on Kadena AFB in Okinawa, Japan. This picture of Richard I. Bong is Copyright © June 2014 Siteseen Ltd. We only allow this picture to be used for printed non-commercial purposes and particularly encourage it's use for printed educational non-commercial purposes. This Richard I. Bong picture is not in the Public Domain. 3) Use of this Richard I. Bong picture, or any of our pictures on websites re-distributing copyright free material is strictly prohibited.